The earliest known trees appear in Devonian. 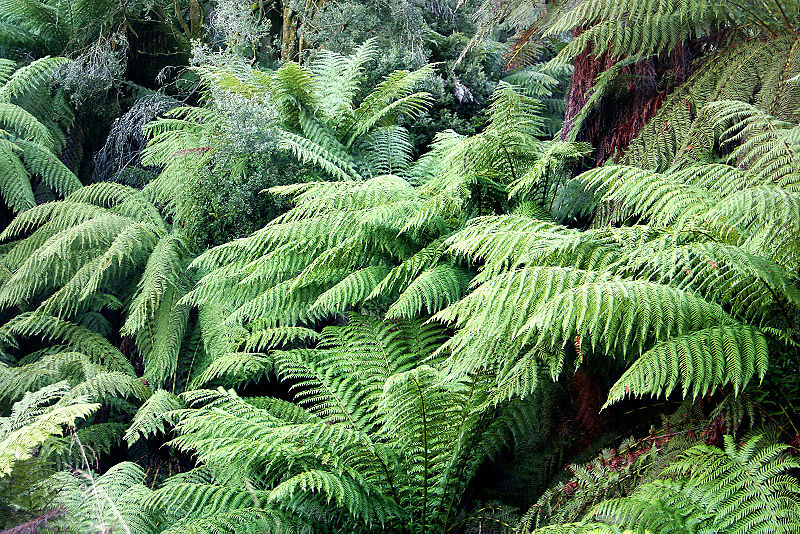 The Late Devonian Wyazzit looked much like the unrelated tree-ferns in the photo and could grow 8 meters high. "The Devonian period marks the beginning of extensive land colonization by plants. With large herbivorous land-animals not yet present, large forests could grow and shape the landscape. Early Devonian plants did not have roots or leaves like the plants most common today and many had no vascular tissue at all. They probably spread largely by vegetative growth, and did not grow much more than a few centimeters tall. By far the largest land organism was Prototaxites, the fruiting body of an enormous fungus that stood more than 8 meters tall, towering over the low, carpet-like vegetation. By Middle Devonian, shrub-like forests of primitive plants existed: lycophytes, horsetails, ferns, and progymnosperms had evolved. Most of these plants had true roots and leaves, and many were quite tall. In the Late Devonian, the tree-like ancestral fern Archaeopteris and the giant cladoxylopsid trees grew with true wood. (See also: lignin.) These are the oldest known trees of the world's first forests. The earliest known trees, from the genus Wattieza, appeared in the Late Devonian around 380 Ma. By the end of the Devonian, the first seed-forming plants had appeared. This rapid appearance of so many plant groups and growth forms has been called the "Devonian Explosion". The 'greening' of the continents acted as a carbon dioxide sink, and atmospheric levels of this greenhouse gas may have dropped. This may have cooled the climate and led to a massive extinction event, Late Devonian extinction." And God said, “Let the waters under the heaven be gathered together unto one place, and let the dry land appear”; and it was so. And God called the dry land Earth; and the gathering together of the waters called He Seas; and God saw that it was good. And God said, “Let the earth bring forth grass, the herb yielding seed, and the fruit tree yielding fruit after his kind, whose seed is in itself, upon the earth”; and it was so. And the earth brought forth grass, and herb yielding seed after his kind, and the tree yielding fruit, whose seed was in itself, after his kind; and God saw that it was good. 3. "Late Devonian Extinction" - "And the evening came" as boundary marks. Five major extinctions are known in the history of life on planet Earth. Genesis has six days of creation before the great Sabbath.